This small but exquisite painting was produced during that critical two months - which turned out to be pivotal for modern art - when Picasso and Braque shared a studio at Ceret. 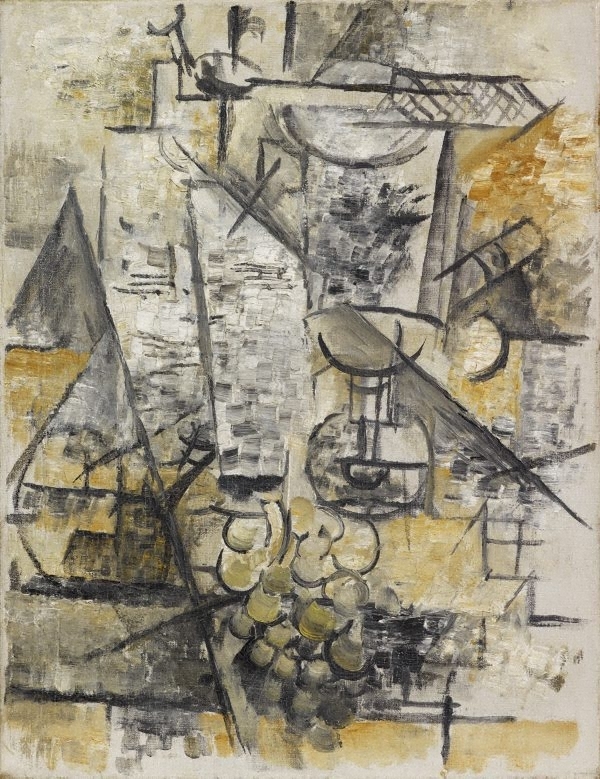 While the cubist experiment is as rigorous here as if it were Picasso, the lyrical touches of colour and the illusionism of the grapes are very much Braque. The architectural forms, such as the steps on the right and the cubic blocks to the left of the absinthe glass, are characteristic of the equal weight both artists gave to the spaces between objects, and their concern to integrate objects into the field. As a result, although certain elements are clearly recognisable - the glass and spoon, the bunch of grapes - others are obscure. Painted the year before Braque introduced papier collé, 'Le verre d'absinthe' records a key moment of analytic cubism. Signed centre verso canvas, oil "Braque". Not dated. Jeanne Bucher (France, b.1872,d.1946), 1930s?, Paris/France, Information from Jean-François Jaeger, Director, Galerie Jeanne-Bucher Paris 27/12/2000: M. Jaeger writes that he can find no mention in their records of the painting being in the collection of Jeanne Bucher but says that T Catesby Jones was a client of Mme. Bucher's in the years preceding the 2nd World War and that the painting could possibly have been purchased from an exhibition at Galerie Jeanne-Bucher. T Catesby Jones, post 1930s, New York/New York/United States of America, Information from John Ravenal, Curator of Modern and Contemporary Art, Virginia Museum of Fine Arts 8/1/2001: their records show that a label verso of frame [label now removed] states that the painting was the joint property of Jeanne Bucher and T Catesby Jones, later becoming the property of Mr and Mrs T Catesby Jones and then by descent to Mrs Richard Riley. Mrs Richard Riley, pre 10 May 1989, Petersham/Massachusetts/United States of America, by descent, daughter of Mr and Mrs T Catesby Jones. Loaned to the Virginia Museum of Fine Arts by Mrs Riley, 2 May 1968 - May 1989, loan no. MA.L40.68.2. Sold at Christie's New York, 10 May 1989, lot no. 61. Christie's New York, 10 May 1989, New York/New York/United States of America, Purchased by Agnew's from Christie's New York, 10 May 1989, lot no. 61. Agnew's, London, 10 May 1989-Oct 1997, London/England, Purchased by the AGNSW from Agnew's 1997. Christine Dixson, Cubism & Australian art , 'Le Verre d'Absinthe [Glass of absinthe]', pg. 13, Melbourne, 2009, 13 (colour illus.). Bruce James, Art Gallery of New South Wales handbook , 'Western Collection: Paintings and Sculpture', pg. 17-77, Sydney, 1999, 53 (colour illus.). Look , 'Georges Braque-Le Verre d'Absinthe', Heidelberg, Jun 1998, 13 (colour illus.). Art Gallery of New South Wales annual report 1998 , Sydney, 1998, 6 (colour illus.). Georges Braque , Rome, 1924, 24 (illus.). Paths to abstraction 1867-1917 , Sydney, 2010, 229 (colour illus. ).